The KONG Cat - Kitten Chirpz Chick stimulate all your young kitten's senses. This cute toy in the shape of a bird starts chirping when your kitten approaches. This will motivate your curious little cat to play with it. In order to keep the game going for longer, a healthy dose of catnip has been added. The Kitten Chirpz Chick from KONG Cat contains all ingredients to entertain your kitten for hours! 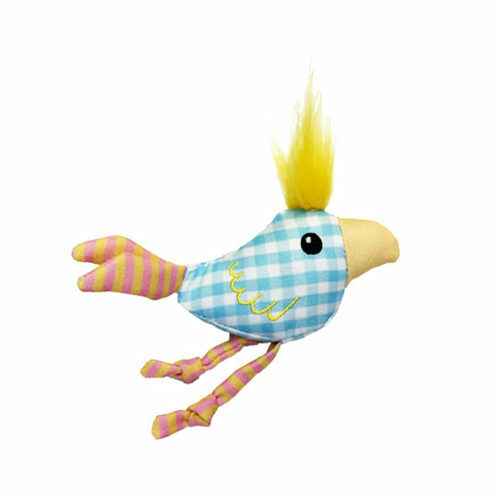 This fun toy in the shape of a bird has a sound chip; as soon as your kitten comes near it, the little bird starts chirping. Your curious little house tiger will certainly be enticed to play. The bird has flexible legs and feathers that will flap around when your young cat starts playing with it. In order to keep the game going for longer, a healthy dose of catnip has been added. Blue or yellow. This product is delivered in random colours, making it impossible to choose a colour. Have you used KONG Cat - Kitten Chirpz Chick before? Let us know what you think about this product.